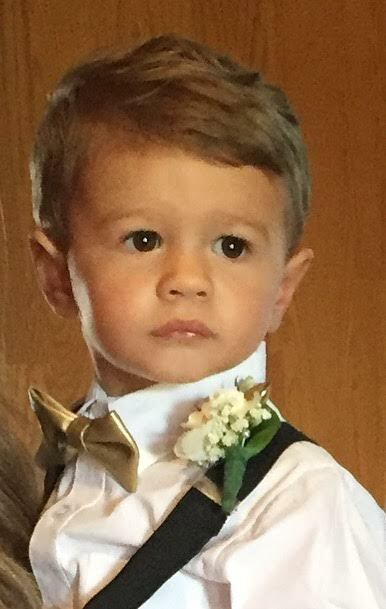 +Getting to watch Camden as a ring bearer in my brother-in-law's wedding on Saturday. Oh my heart-you guys! I can't even tell you all how proud we are of him and how well he did. 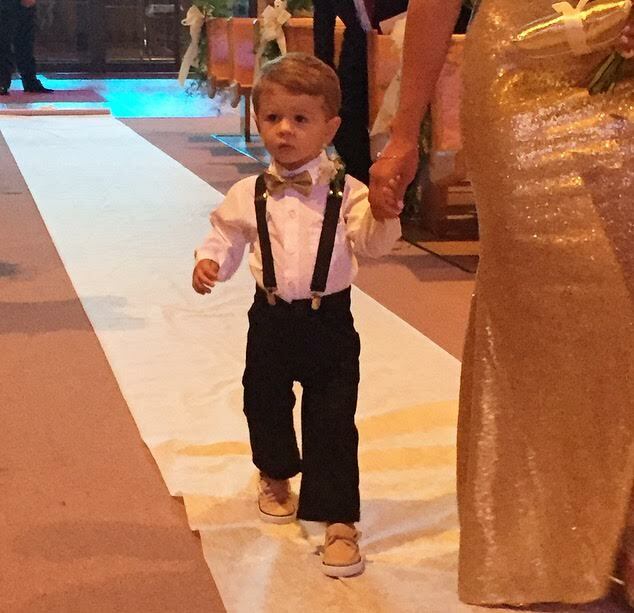 We were unsure how he would do walking down a long aisle with a hundred people staring at him (and holding someones hand he didn't know) but he completely 100% ROCKED it! He walked the slowest I think he's ever walked and had this look on his face like, "why is everyone looking at me?!" It was literally the cutest thing I've ever seen. 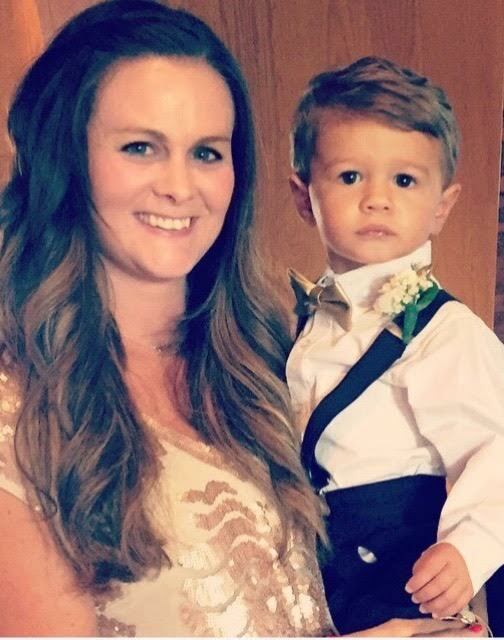 You know, besides his cute wedding attire (that gold bow tie and those suspenders!) that had my heart practically bursting out of my chest. +Grayson being an absolute angel and sleeping for the entire ceremony AND reception. Man, little boys. They're just the best. 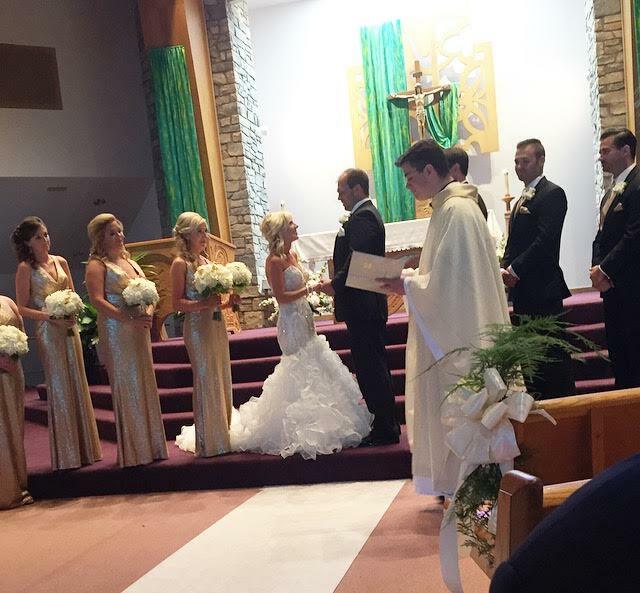 +Billy's brother is MARRIED! We couldn't be happier for him. The bride looked so gorgeous and we're excited to have her in the family now! Billy was the best man and got so many compliments on his best man speech - he had the whole room laughing. +Having the help of my parents for the day of the wedding. Since Billy was in the wedding, my parents offered to help me out with the kids and let's just say thank the lord for them! 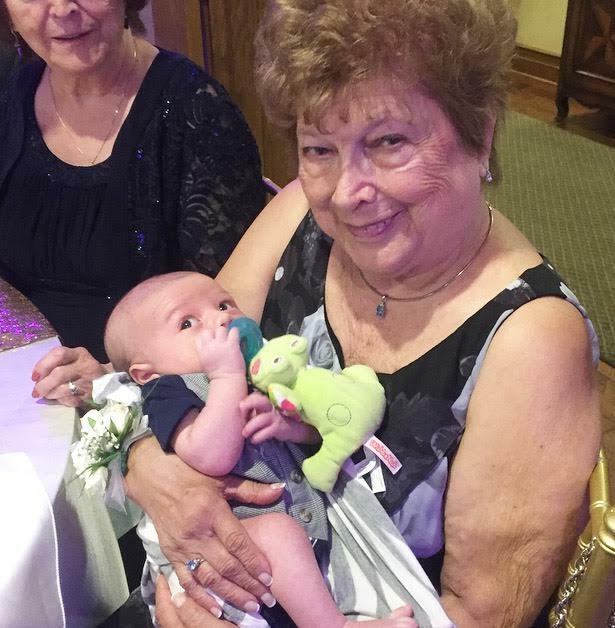 My stepmom held Grayson in her arms while he slept for practically the entire reception, and I even got some dancing snuggles out of Camden. Definitely goes down in my memory as something I won't forget. +Fitting into the dresses that I rented from Rent the Runway. That's always a plus, right? +Even with the help of grandparents, still being utterly exhausted by the time 7pm rolled around. It was seriously tough carting around 2 kids for a wedding all day / night long and being off normal routines, etc. +Rent the Runway forgetting to send the undergarments for one of the dresses. You know, for the one that was practically see through and that you needed to wear a full length slip with otherwise you'd be giving everyone quite a show. FAIL. I had to scramble and go out and buy one that matched my dress at the last minute. +That due to the business of the wedding, we forgot to get a group family picture with the four of us. How could I forget that?! +That due to the above I haven't focused much on my blog. It's getting the backseat right now but I know it's only temporarily. 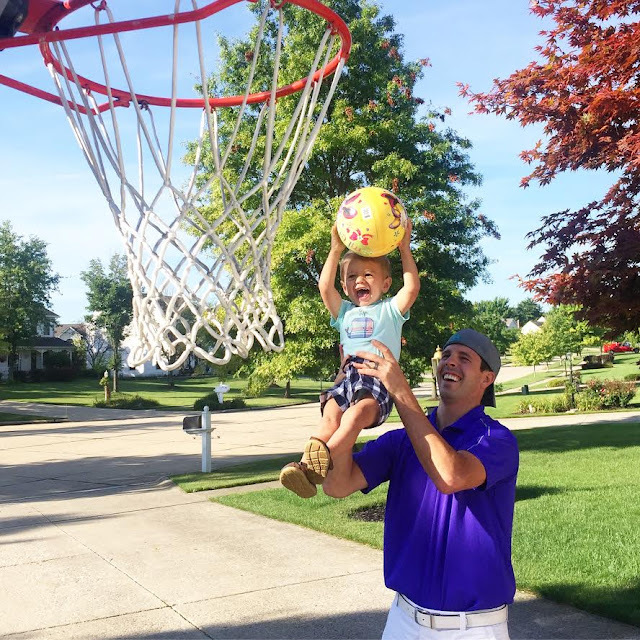 I'm struggling to find a balance between being the best mom I can be and also get some good quality posts up! I hope you all are okay with just 2 or 3 posts a week until I get into a better routine (and am on more sleep) because I know it's coming. What have been some of your high's and low's lately?! 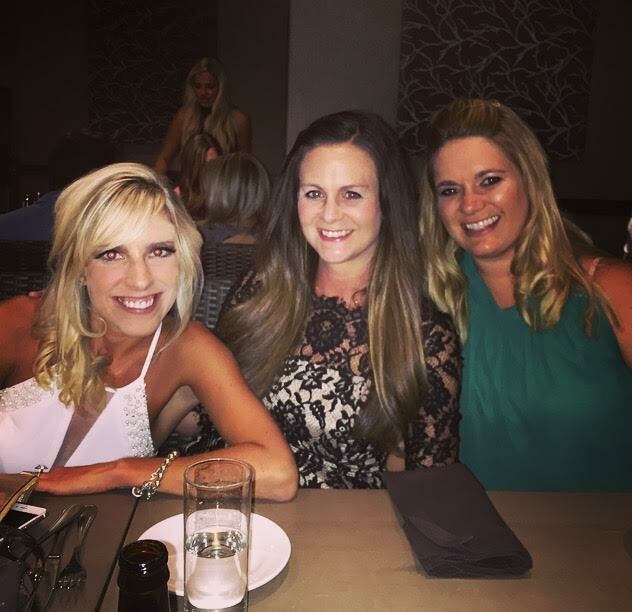 I miss you guys-share with me! PS: How do we feel about Nick being the next Bachelor? I am obviously bummed it's not Chase (my fav from JoJo's season) and I actually hated Nick during Andi's season, but I'm actually pretty excited to watch it and for him! Anyone else? I think Nick is actually very smart and intuitive, but I think that could actually bring a new light to the show as the "so are you ready to get married, have kids etc" conversations are getting so boring and redundant! I don't really care about him, but I'm sure I'll still watch! Sorry to hear about the bike accident. I think that happens all the time on those, so I hear, we don't use one, but for that reason :( hope you are adjusting to 2 under 2 ok! Oh no sweet friend, I am so sorry about the bike accident - that is so scary! We have had one in Ellie's little bike which flipped over with her in it - it is so scary but is glad he is ok... Weddings with kiddies is so hectic, especially a baby too!! Oh my gosh, I got so sad reading about the bike accident!!!!! I'm sure it still is sad and scary thinking about it! So glad everyone is ok and it's just bumps and bruises! I swear I cry when my Camden falls down on the carpet, so I'm sure this was just petrifying for you and Billy! 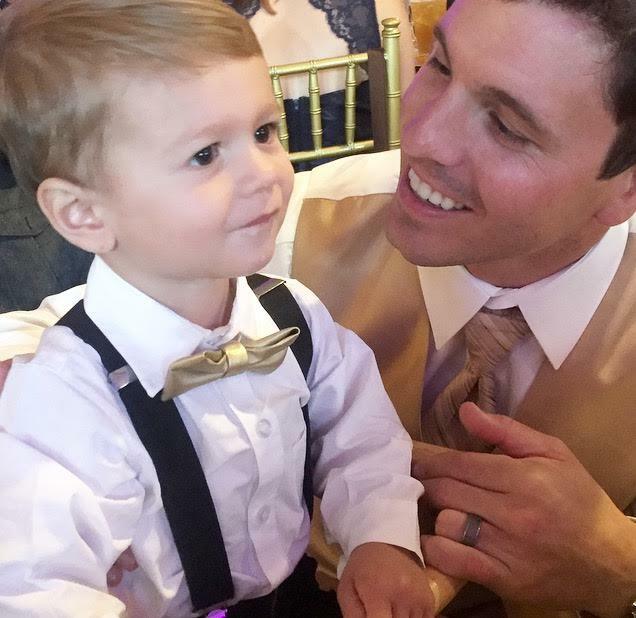 What a precious little nugget Camden is... so handsome and dapper as the little ring bearer - I'm sure you and Billy were just bursting with pride! You look fabulous as well for having a a newborn! Hopefully this week is just all high's for you! My husband and I had a particular vision for our wedding, and we were struggling to find the right venue, until we came across this place. I liked these San Francisco wedding venues, the manager and his team are second to none.